The QDockWidget class provides a widget that can be docked inside a QMainWindow or floated as a top-level window on the desktop. QDockWidget provides the concept of dock widgets, also know as tool palettes or utility windows. Dock windows are secondary windows placed in the dock widget area around the central widget in a QMainWindow. 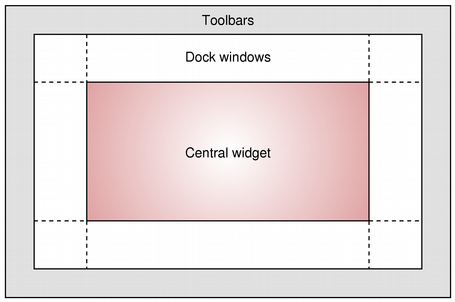 Dock windows can be moved inside their current area, moved into new areas and floated (e.g., undocked) by the end-user. The QDockWidget API allows the programmer to restrict the dock widgets ability to move, float and close, as well as the areas in which they can be placed. A QDockWidget consists of a title bar and the content area. The title bar displays the dock widgets window title, a float button and a close button. Depending on the state of the QDockWidget, the float and close buttons may be either disabled or not shown at all. The visual appearance of the title bar and buttons is dependent on the style in use. A QDockWidget acts as a wrapper for its child widget, set with setWidget(). Custom size hints, minimum and maximum sizes and size policies should be implemented in the child widget. QDockWidget will respect them, adjusting its own constraints to include the frame and title. Size constraints should not be set on the QDockWidget itself, because they change depending on whether it is docked; a docked QDockWidget has no frame and a smaller title bar. See also QMainWindow and Dock Widgets Example. QDockWidget::DockWidgetClosable 0x01 The dock widget can be closed. On some systems the dock widget always has a close button when it's floating (for example on MacOS 10.5). QDockWidget::DockWidgetMovable 0x02 The dock widget can be moved between docks by the user. QDockWidget::DockWidgetFloatable 0x04 The dock widget can be detached from the main window, and floated as an independent window. QDockWidget::DockWidgetVerticalTitleBar 0x08 The dock widget displays a vertical title bar on its left side. This can be used to increase the amount of vertical space in a QMainWindow. QDockWidget::AllDockWidgetFeatures DockWidgetClosable | DockWidgetMovable | DockWidgetFloatable (Deprecated) The dock widget can be closed, moved, and floated. Since new features might be added in future releases, the look and behavior of dock widgets might change if you use this flag. Please specify individual flags instead. QDockWidget::NoDockWidgetFeatures 0x00 The dock widget cannot be closed, moved, or floated. The DockWidgetFeatures type is a typedef for QFlags<DockWidgetFeature>. It stores an OR combination of DockWidgetFeature values. This property holds areas where the dock widget may be placed. This property holds whether the dock widget is movable, closable, and floatable. By default, this property is set to a combination of DockWidgetClosable, DockWidgetMovable and DockWidgetFloatable. This property holds whether the dock widget is floating. A floating dock widget is presented to the user as an independent window "on top" of its parent QMainWindow, instead of being docked in the QMainWindow. By default, this property is true. This property holds the dock widget title (caption). By default, this property contains an empty string. Constructs a QDockWidget with parent parent and window flags flags. The dock widget will be placed in the left dock widget area. The window title is set to title. This title is used when the QDockWidget is docked and undocked. It is also used in the context menu provided by QMainWindow. This signal is emitted when the allowedAreas property changes. The allowedAreas parameter gives the new value of the property. This signal is emitted when the dock widget is moved to another dock area, or is moved to a different location in its current dock area. This happens when the dock widget is moved programmatically or is dragged to a new location by the user. This signal is emitted when the features property changes. The features parameter gives the new value of the property. Initialize option with the values from this QDockWidget. This method is useful for subclasses when they need a QStyleOptionDockWidget, but don't want to fill in all the information themselves. Returns true if this dock widget can be placed in the given area; otherwise returns false. Sets an arbitrary widget as the dock widget's title bar. If widget is 0, the title bar widget is removed, but not deleted. If a title bar widget is set, QDockWidget will not use native window decorations when it is floated. Mouse events that are not explicitly handled by the title bar widget must be ignored by calling QMouseEvent::ignore(). These events then propagate to the QDockWidget parent, which handles them in the usual manner, moving when the title bar is dragged, docking and undocking when it is double-clicked, etc. The title bar widget must have a valid QWidget::sizeHint() and QWidget::minimumSizeHint(). These functions should take into account the current orientation of the title bar. Using qobject_cast as shown above, the title bar widget has full access to its parent QDockWidget. Hence it can perform such operations as docking and hiding in response to user actions. See also titleBarWidget() and DockWidgetVerticalTitleBar. Sets the widget for the dock widget to widget. If the dock widget is visible when widget is added, you must show() it explicitly. Note that you must add the layout of the widget before you call this function; if not, the widget will not be visible. Returns the custom title bar widget set on the QDockWidget, or 0 if no custom title bar has been set. Returns a checkable action that can be used to show or close this dock widget. The action's text is set to the dock widget's window title. See also QAction::text and QWidget::windowTitle. This signal is emitted when the floating property changes. The topLevel parameter is true if the dock widget is now floating; otherwise it is false. This signal is emitted when the dock widget becomes visible (or invisible). This happens when the widget is hidden or shown, as well as when it is docked in a tabbed dock area and its tab becomes selected or unselected. Returns the widget for the dock widget. This function returns zero if the widget has not been set.